Surface Treated Composites White Book - A proven, non-toxic, cost-effective alternative technology for underwater ship hull protection and biofouling control. The Surface Treated Composites White Book is a description of a better, alternative, non-toxic, cost-effective, environmentally safe technology for protecting the underwater hulls of ships and keeping them free of biofouling. “Alternative” because it takes a 180° opposite vector to the generally used, conventional systems of painting the underwater hulls of ships with highly toxic heavy metals and biocides as a means of protecting the hulls and keeping them clean. “Better” because its standard application can reduce the cost of maritime transport significantly while greatly lowering the environmental impact of shipping. This alternative technology begins with the premises that the marine environment should be kept clean and free of toxic chemicals which pollute the water and contaminate the sediment, that shipping should be able to operate and expand without harming or destroying the very environment on which it operates, that there is a non-toxic answer and that that answer is also the most economical way to sail. 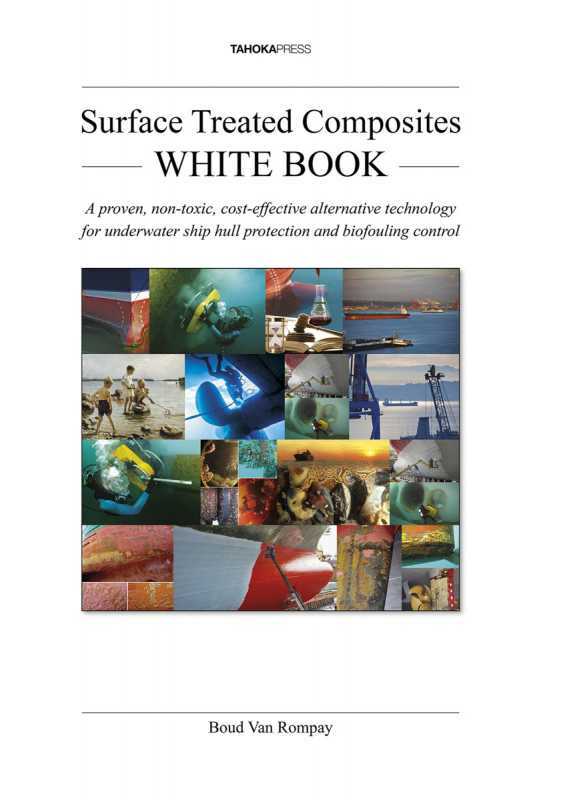 The Surface Treated Composite White Book is essential reading for anyone who has any connection with protecting the underwater hulls of ships, who is responsible for operating ships economically, for reducing the impact of shipping on the environment. Shipowners, ship operators, officers, naval architects, ship builders, the IMO, government officials responsible for maintaining a sustainable marine environment, officials in charge of navies and government owned and operated fleets, NGOs, shipyard operators, anyone who has any interest in or responsibility for the efficient and ecologically sound operation of ships and shipping. The book is the result of 40 years of research, development, study and practical application and experience added to the wealth of information on the subject which has been researched and recorded by caring and intelligent minds around the world. A preview of the White Book can be downloaded here. Please email editors@shiphullperformance.org to buy a copy of the book.